Revamped for 2017 with fresh looks and impressive safety features, the fun-to-drive Mazda CX-5 compact SUV remains the athlete of its class. The 2017 mazda cx 5 electric vehicle qualifies for a federal tax credit of up to $7,500, effectively reducing the net base price. The 2017 CX-5 is Mazda's compact-crossover SUV, a 2-row/5-passenger vehicle that slots between the subcompact CX-3 and the 3-row CX-9. The CX-5 is all-new for 2017, and it enters its second generation with sharper looks inside and out, enhanced technology and safety features, a strong value proposition and even a forthcoming diesel model. Like the recently revamped CX-9 flagship, the CX-5 boasts premium flair thanks to sleek design and available amenities like leather seating, power tailgate and Bose audio. Of course, rivals such as the Honda CR-V, Toyota RAV4 and Ford Escape offer similar features. What sets the Mazda apart is its athleticism. While it has matured, the 2017 Mazda CX-5 remains the liveliest, most fun-to-drive crossover SUV in its class. If you want a small SUV that is fun to drive, boasts stylish design and has impressive standard safety features such as automatic emergency braking, the CX-5 checks all the right boxes. Loaded up in Grand Touring form, it could give luxury-compact SUVs a run for their money. If sheer interior room is more important to you than zesty driving manners, you might prefer the CR-V or RAV4, which pack more cargo space than the Mazda. If power is your thing, turbocharged versions of the Subaru Forester, Ford Escape and Kia Sportage pack plenty more of it. The Mazda CX-5 compact SUV is all-new for 2017, which marks its second generation. The former base 2.0-liter gasoline engine and manual transmission are gone, with the 2.5-liter as standard. A diesel CX-5 is slated to arrive later in the model year. The Mazda CX-5 has always been among the liveliest and most fun-to-drive SUVs available, and certainly the most in its class. Just don't confuse "liveliest" with "most powerful." The CX-5 has just enough verve to make it feel swift from a standstill, but sheer acceleration isn't its strong suit. The CX-5's real strength is its agility and nimbleness. If you're a driver who actually speeds up when the road twists and turns, the CX-5 is the crossover SUV for you. Steering feel is further improved (taut yet not heavy or artificial) and engaging the Sport mode optimizes the powertrain for even more responsiveness. Thankfully, the Mazda's dynamics don't come at the expense of a harsh ride. Overall quality has been improved, and the suspension better absorbs road imperfections. G-Vectoring Control -- an almost imperceptible use of engine timing to create a smoother driving experience -- is now standard on the CX-5. This safety system can reduce the damage from -- or altogether prevent -- a frontal collision at speeds from 2 to 19 mph by first alerting the driver and then automatically applying the brakes if an impending collision is sensed. Best of all, it is standard on every 2017 CX-5. This optional safety system has also been improved. Whereas in the previous model the system could be overly sensitive, the new CX-5 reads lanes well and warns the driver with a more agreeable, lower-pitch audible warning. A secondary system can even nudge the vehicle back into its lane. All CX-5 models have two rows of seating for up to five passengers. Like its rivals, though, trying to fit three adults in back can be a squeeze. On the other end of the spectrum, installing child seats is now easier thanks to rear doors that open wider. Mazda’s interiors feel a class-above: From the standard push-button start and 7-inch touch-screen display with command dial down to the elegant air vents surrounded by brightwork, this is one classy cabin. With 40/20/40-split rear seats folded, cargo room maxes out at just under 60 cubic feet -- nearly 16 less than a Honda CR-V. The CX-5 has always been a fine-looking vehicle, but this all-new version ups the ante to arguably the classiest in its segment. Thank the cues taken from its svelte big brother, the CX-9. 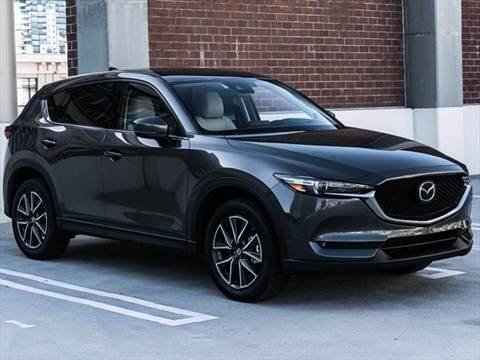 Like that midsize SUV, Mazda's compact-crossover utility vehicle begins with a prominent trapezoidal grille connected to fancy-looking -- and bright -- LED headlight slits and extends to a flowing "Kodo" design meant to invoke a "refined toughness." We think it works well. This is most true in the new Soul Red Crystal paint, a production color so deep and glossy that it'd do justice to an exotic sports car. The 2017 CX-5 is again offered in three main trims: Sport, Touring and Grand Touring. The least expensive CX-5 Sport model includes keyless entry with push-button start, 17-inch wheels, the Smart City Brake Support active safety system, and rearview camera. The base infotainment system includes a 7-inch touch screen with 4-speaker AM/FM/HD Radio, twin USB inputs and an auxiliary port. 2017 marks the year the CD player went extinct in the CX-5. At launch, Apple CarPlay and Android Auto are not in the offering, but Mazda says the systems can be retroactively added later. For less than $2,000 more, we recommend the mid-trim CX-5 Touring model, which replaces the base model's 6-way-manual driver's seat with a power-adjustable one and adds Leatherette instead of cloth interior, plus heated front seats, dual-zone climate control, blind-spot monitoring, two rear USB charging ports, rear privacy glass and auto-leveling headlights. Grand Touring models add leather seating, 10-speaker Bose premium audio system, navigation, radar cruise control, lane-departure warning and lane-keep assist, and Smart Brake Support, which works at higher speeds than the basic version. Further options include a head-up display, heated steering wheel and heated rear outboard seats. Upon launch, the 2017 Mazda CX-5 will offer just one engine, the 2.5-liter 4-cylinder Skyactiv gasoline powerplant that carries over from the previous model (but adds three horsepower). Tied to a 6-speed automatic transmission, the engine is neither the most powerful nor most efficient in its class, but it puts up respectable numbers, especially in fuel economy of up to 31 mpg. The standard setup is front-wheel drive (FWD), with all-wheel drive (AWD) optional. The CX-5 is rated to tow up to 2,000 pounds. After years in the making, Mazda says it will finally bring a diesel CX-5 to the U.S. market in the second half of 2017. The diesel model is set to use a 2.2-liter 4-cylinder that is touted for its torque and fuel efficiency. Stay tuned for our impressions on that one. The 2017 Mazda CX-5 has a Manufacturer's Suggested Retail Price (MSRP) starting at $24,985, including destination. The more recommendable Touring model, with its additional safety features and amenities, still offers a lot to like for $26,855. Top-line Grand Touring models begin at $30,335. Adding all-wheel drive to any model is an additional $1,300. Fully loaded, a 2017 CX-5 Grand Touring model dressed in Soul Red Crystal ($595) can reach past $34,000. At its starting price, the CX-5 is right in line with the Honda CR-V, slightly under the Toyota RAV4, and slightly above the Ford Escape and Nissan Rogue. A Kia Sportage, Hyundai Tucson and Subaru Forester also start below the CX-5. Before buying, be sure to check the KBB.com Fair Purchase Price to see what others in your area are paying. Historically, the CX-5's resale value has held up well, though not to the extent of the CR-V.
Sporty, fun to drive, good cargo space and AWD! Compare Apples vs Apples, WOW Its AWESOME!!!!!! !